You know Kumamon? That bear has spawned memes in the West and is incredibly popular in Japan. One of these bear characters is not Kumamon. As reported on News 47 and NM Plus (via Afternoon News), starting April 9, a character called “Lucky Bear” began popping up on Lucky! Make a Profit! Make a Profit! Make a Profit!, a TV show broadcasted in Anhui, China. The character also has a following in China, and earlier this year Japan’s Mainichi News reported that a Chinese toymaker was fined for selling fake Kumamon toys. 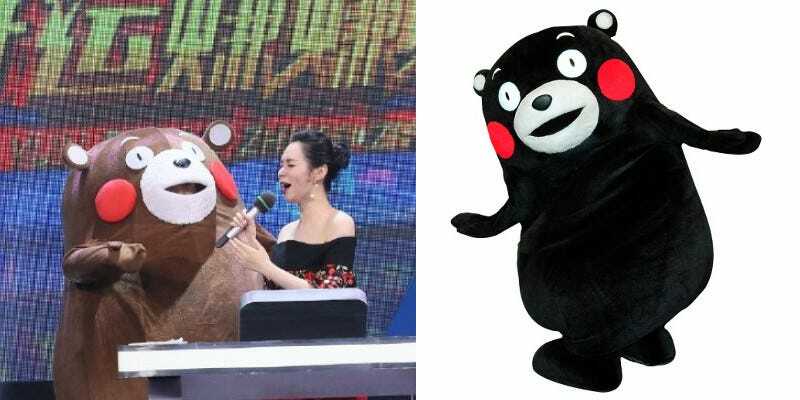 Via Hong Kong’s Next Media, here is a comparison between Lucky Bear and Kumamon (in the red circle). The Lucky Bear does resemble Kumamon, but has dark brown fur instead of black. Also, the Lucky Bear’s costume quality doesn’t appear as high as Kumamon’s. So, this bear gets stuck in stuff, too, like the cute characters in Japan? Um, okay. Online in China, people have been critical, News 47 reports, writing things like, “Isn’t this embarrassing?” and wondering if it wasn’t a copy. Others flat out called it a rip-off and said the show should be ashamed. As of yesterday, the Lucky Bear continued to appear on the program. The show doesn’t seem to have addressed these criticisms. If this is a rip-off, what makes it truly unfortunate is that that starting on April 14, Kumamoto Prefecture was hit devasting earthquakes that killed over 40 people and have injured thousands more. That’s why if this is a rip-off, and it does look suspiciously similar, then it comes at the worst possible moment. In Japan, the real Kumamon has been doing charity work and fundraising to help those affected by the quakes. Kumamoto Prefecture does not charge to use Kumamon’s likeness. Instead, interested parties must fill out an application and must agree to use the character to promote Kumamoto Prefecture. As the BBC reports, the character’s licensing rules have recently been streamlined for quake fundraising. But the key thing is that use of Kumamom must either promote or help Kumamoto Prefecture. This show does not, apparently. The Lucky Bear began appearing appearing on television weeks before the earthquakes, and isn’t doing quake fundraising and doesn’t appear to be helping anyone, other than the show’s contestants win stuff.